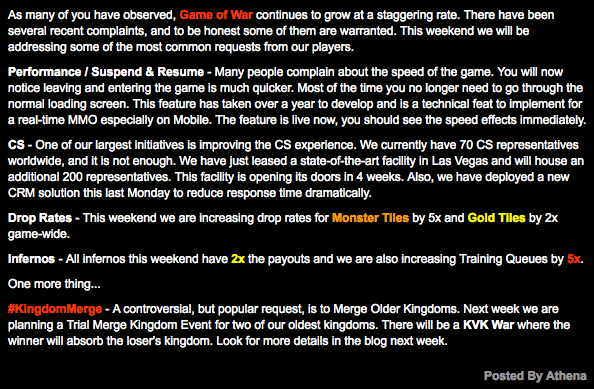 MZ have announced on their official blog some acknowledgement of the recent ‘boycott’ activity in almost all kingdoms. The full detail is here. But since then, the level of activity has been pretty astonishing, with just about all kingdoms having some form of mass protest. 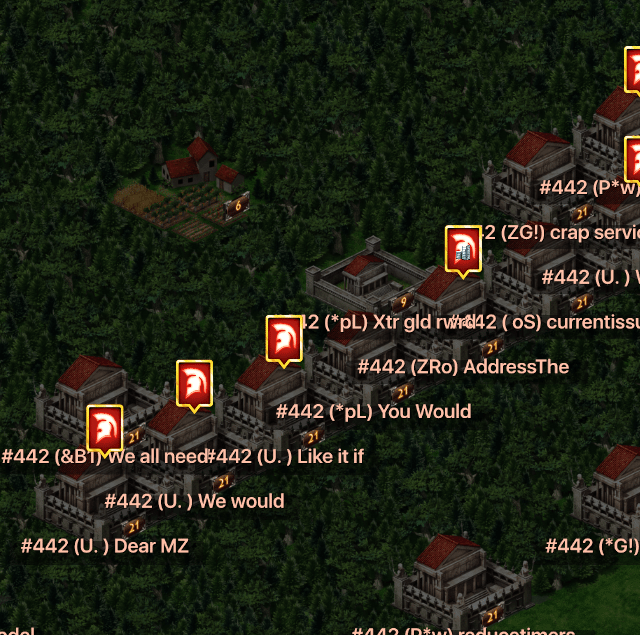 One of the most impressive is Kingdom 442 – Melba, which has arranged their own open letter to MZ with their list of complaints and suggestions. And what is clearly obvious, is that the list is a lot broader than the ones addressed by MZ in the above blog post. Yes, it is fantastic that app loading times are better, that leaving and entering the game is much quicker. 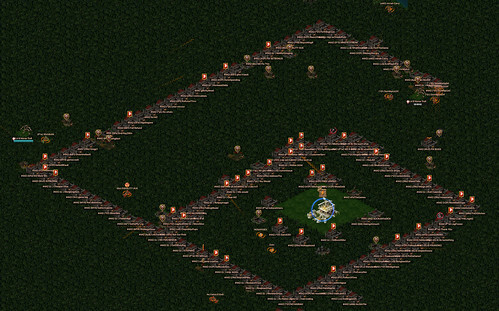 We doubt there are too many people who have complained about the speed of leaving the game. On the contrary, the speed of startup of the app only really matters in the situation where the app has CRASHED, and the user has been booted out of their account due to some unknown bug. This is what a large proportion of the complaints are about, having their app crash when being soloed, or rallied, or when trying to equip a hero gear preset when leading a rally. And when the first thing that pops up when you load the game is a gold pack sale screen (creating 1-10 seconds of lag / freeze in which you can’t do anything), not too many people care appreciate having their chance of shielding / teleporting / equipping a preset delayed whilst MZ downloads the latest gold pack sales graphics. This is the start of K442’s open letter to MZ. But that is just the start of their letter. If you want to see the full list of complaints snaking all the way around the wonder in a huge display of concern, you’re going to need some seriously good eyesight, because it stretches all the way around the wonder, as you can see below. But you can click on the below photo to see it in all its glory. If you have examples of kingdom protests like the one above in Mabel, please let us know by sending an email to contact@insidegameofwar.com. Screenshots would be fantastic. Anybody hear how this turned out? I noticed there are still plenty of people in all 4 kingdoms. The first four kingdoms were announced today. #1, 2, 6, 8. The event is structured so the winning kingdom absorbs the fourth place kingdom, and the second place absorbs the third. I’m rather puzzled to see #2 Aephra on that list, as they seem to hold their own in KvK Kill tournaments. I’d interpret that as having good activity. Technically its deflation. My money has more power in the future. Not less. So why spend now when, if I wait, I can get more for my money? The latest bait and switch….monsters. The blog states currently 3x drops for hits and kills. Great news, right? Only one slight problem. No monsters to be found in over 4 hours in my kingdom 408. Oh wait, I did see a total of 3 during these 4 hours. Is anyone having problems with chat since this update? I am on an apple device and every other word is all of a sudden doubling letters or skipping letters lag is worse and it is impossible to do much. Is it only me? i have sent a photo fo the forest protest of kingdom 326. We also are skeptical and waiting for the crash problems to be adequately addressed before anything else happens. The latest blog admitting that there was an actual problem identified with crashes during battle was a first step. But it doesnt make up for the lost troops andfrustration trying to get them to admit there was a problem for months on this issue. The inflation doesn’t level the playing field, though. Several months ago, T4 troops meant something. Now with the new Defense, Set Gear, and March trees, there is a huge power gap between a big spender and a modest spender. Factor in mega-cores and mega-gear, and the power gap is insurmountable. Banning rooms and silencing people shows that the boycott was working and MZ is scared. mz reply is a total red herring. Load time was not the issue. The issue is getting constantly booted from the game which they still do not acknowledge. I disagree on your point about inflation. It may breed resentment in those who “had” to purchase packs with 1/3 of the items today’s packs have, but it will bring new players up to higher levels cheaper and more quickly. This levels the playing field and keeps newer players around longer…and spending more. The problem with inflation is that it masks the most serious flaws in the game by keeping players focused on an vicious cycle of buying and growing. It’s pretty interesting that the “other” GOW site/blog has been silent on this. Its not inflation of packs that are the problem. Its inflation of research that forced it. The real problem is MZ greed. Take march preset for example….you have to spend for the privelage of having the ability and then have to spend more to use it every time at a stupid high cost. Everything MZ does is make you spend to unlock and then make you spend more to use what you already paid for. After the message was posted on the blog my lag immediately got worse. In fact, it was the worst it’s ever been. The rate of inflation has gotten out of control. Just a few months ago it was a significant achievement to unlock t4 troops (and several hundred dollars). Now you can get there with one basically one pack. In any economy, hyper-inflation is the tell tale sign of an impending collapse. I’m against a boycott. I think we, the players, would be better off cutting our losses and moving on. It’s a tough pill to swallow but in the long run we would be better off. The game has reached such an unstable point that there is no recovering or fixing it. Packs have twice as much as they did a month ago. That is an unsustainable rate of inflation and a serious red flag that the game is going downhill fast. They do it to hide the increases in power requirements to score in the math. Make it cost more to score the prizes yet make it look good by offering 5x the points per power. (People do the math on the first research). Then the second thing required to research gives less power for more speedups. Confuse the math and people wind up stuck in the middle of an inferno with a choice to let the top prize go or buy gold to finish it. Then you change it to 4x and offer higher prizes to hide the cost increase. It mathematics bait and switch. Because unlike training, which is set in requirements and speed, they can tinker with research requirements and force us to spend more money on useless prerequisite research trees, making us buy more packs. It’s all about research now because they arbitrarily set the market and prices at will. Unfortunately I, like many, view the recent blog post with extreme skepticism and see it as more of the same and nothing but self serving of the developer. MZ is trying to Pacify the masses with a game wide boost, and with that, they know full well in order to take true advantage of it that would require a pack or two purchase – go figure!! Let’s top that off by promoting us all seeing immediately a better app launch time which hasn’t improved in any measurable way especially when you consider you have to still wait and clear the full screen advert that’s pulled from a ad server before gaining control. Depending on connectivity variables it can be quick, or sometimes painfully slow. A Faster logoff – What’s that? If I am not instantly thrown out of app back to home screen due to app crash I could care less how fast it gets back there if I just press the home button. I can only hope for the day where I can get back to home screen after playing the app without it being due to crash. If MZ truly wants to quell the uprising and discontent they can start by cutting the crap. Prove by clearly demonstrating in measurabe and noticeable ways they are going to exclusively focus on game stability before adding new things. Finish what is incomplete and already there – alliance city anyone?? To hell with all the smoke & mirrors or the wish lists for now. Clean the code up in the the things already broke in the damn app and make it stable as it currently is before adding yet another purported long requested feature. What’s long requested is stability – its been ignored, but technically it is not unobtainable or a huge financial expenditure. They have the foundation – clean up and throw out all the crap that really serves no purpose other than to slow the game down. Virtually every user button click is a popup thing; monster kill & gifts a popup, quest complete a popup… You name it – there are pop ups that can’t be turned off… Get rid of the resource draining crap that has little or no value to game maker or the user. Point out to me how a popup alerting me that I have received a help button push by alliance member each and every time is valuable to me or the game maker. I can determine how many helps I have received easily, but it’s terribly disruptive to my screen to receive the popup telling me something I don’t need to know. Each and every popup creates a noticeable pause or delay in other actions and sometimes it’s a fraction of a second that can determine success with something and it can be ruined because the game thinks I need to know another monster was killed by someone. 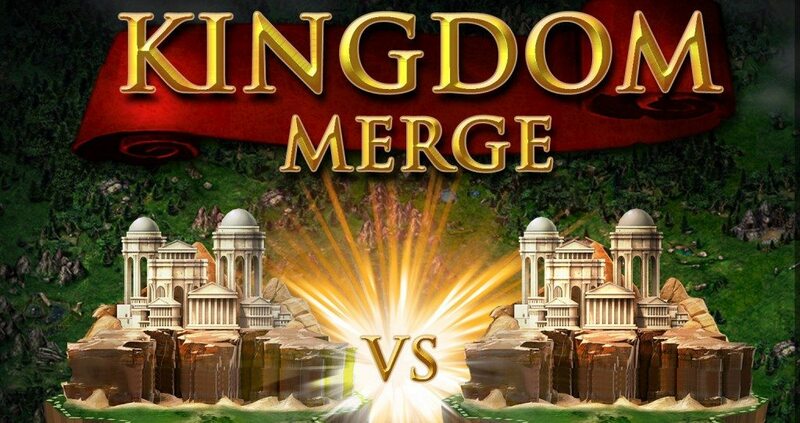 Fix the crap that is noticeable and real now before talking to me about how cool a kvk war will be where kingdoms are merged by results. And lastly – MZ should instruct their paid marketing hacks to cease with the obvious planted favorable reviews in the app stores – amuture at best and that kind of thing just further enforces the informed with a view MZ is trying to hide and mask the real problems just to rake in more money and are not interested in fixing the existing fundamental problems. There is an old famous saying – “if you build it they will come.” Meaning – if you Build it right, you won’t have to pay someone to plant favorable reviews – happy customers will do it willingly for free because they will want others to enjoy it as well. I encourage everyone to throw at minimum a 7 day shield on and fully support the boycott actions until the developer can show they are seriously going to make the needed changes. Has anyone created a new account recently? Notice how the events are all dungeon events and no research or building events and two different dungeon packs are available. They are working hard to drive new players into the pack buying frenzy. This is not a game in the classic sense where player enjoyment is the focus. MZ wants money and they will not do anything that doesn’t increase profits. These quick “fixes” were released with a new $50 Troop Building pack and people are buying it! The new ‘quick’ log in that they’ve been working on for a year does not work if the app has crashed. That’s when we need it most as it’s because the app has crashed we’re probably doing something important like taking a hit and need to get back in asap not waste time waiting for it to load and then another 10 second delay for them to load up their Gold advert and peddle some more of their rip off gold packs. Yeah poor form closing down the boycott chat rooms. Guess they don’t believe in freedom of speech..! Very true, I never understood why they felt the need to change the points for research to 4 or 5 times… it worked better as 1 point for research. THeir supposed response is a joke. Monster cave drop rates weren’t the issue its drop rates from chests, and increasing payouts on infernos doesn’t change the fact that troop training for an inferno is still impossible even with 500% troop training capacity. Please bring up the fact that MZ closed down all the “boycott” chat rooms today !! !